Do you like old-style crime movies? Well you can create the same cool and mysterious vibe of those classic detective flicks with a few simple tools in Photoshop. In this tutorial, learn how to turn any photo into a film noir effect using Adjustment Layers, Blend Modes, and the Smudge Tool. Let’s begin! Open your image into Photoshop. I’ll be using this photo of a woman in a military uniform because it screams power, seduction, and strength. Try to find a photo like this with a similar mood. Originally the image is 1117×1680 pixels, but we’ll make the canvas size bigger to add more room for the subject. Go to Image > Canvas Size and change the dimensions to 1224×1705 pixels to create more space vertically and horizontally. Create a New Layer and place the layer underneath your reference. Fill this layer to match the background with a dark gray color (#222222). Use the Eraser Tool (E) to erase away any harsh edges on the photo so that it blends perfectly to the background. Then Merge the layers together. Select the Blur Tool and set the Strength to 100%. Begin blurring the pores of the skin on the face and body so that the skin is silky smooth. Next, grab the Chalk Brush from the preset list and paint dark gray texture onto the end of the cigarette so that it looks like its truly burning. Now let’s turn this photo black and white. Go to Layer > New Adjustment Layer > Hue & Saturation. Set the Saturation to -100. Now select the white layer mask that’s attached to the adjustment layer. 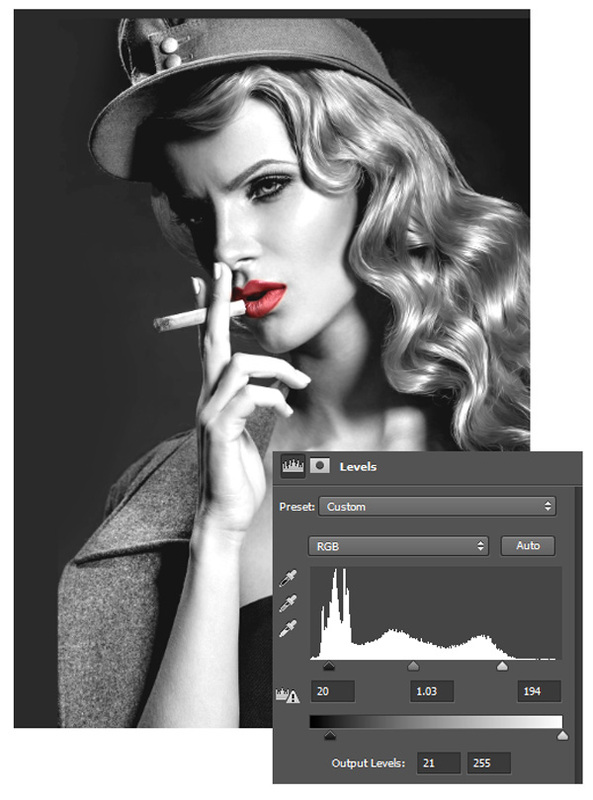 Use the Brush Tool (B) to paint black onto the lips in order to let the original red lipstick show through from the photograph. Adjust the photo even further to make the shadows as black as possible without losing too much detail. Go to Layer > New Adjustment Layer > Curves and adjust the curves in the RGB Channel for richer shadows. Let’s create a cool blinds shadow effect. 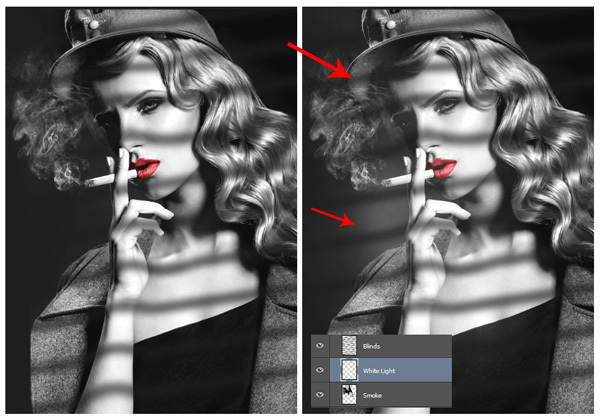 Create a New Layer and set the Foreground Color to the same dark gray from before. 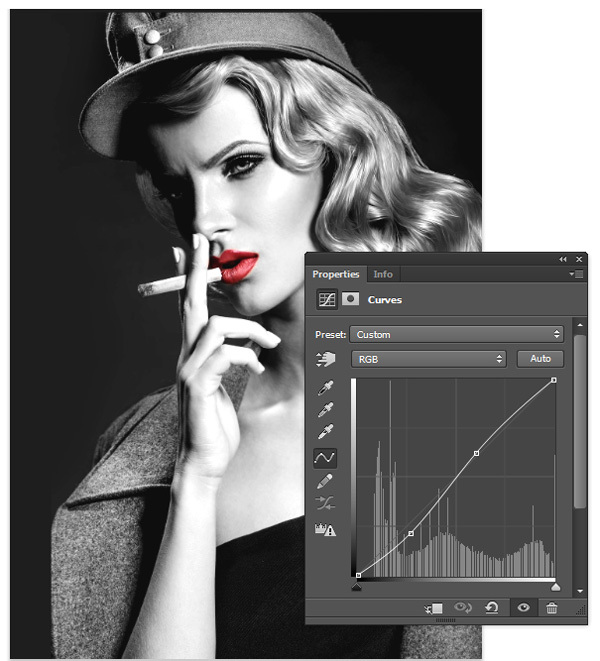 Use the Brush Tool (B) to create solid straight lines across the photo with equal spacing with a Solid Round Brush. Hit Control-T to Free Transform and Rotate and Resize the lines to be at an angle. Go to Filter > Blur > Gaussian Blur and set the Radius to 14 pixels for a soft blur. 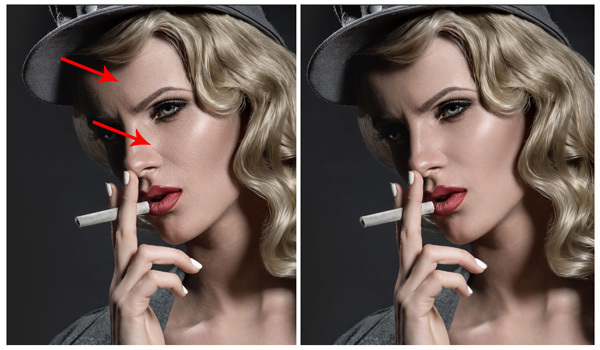 Use the Smudge Tool (O) to gently lift areas where the shadows would bend on the face and body. When you’re finished, bring the Opacity of the layer down to 69%. 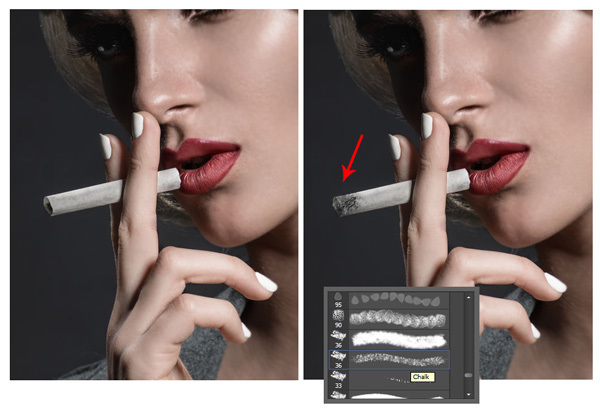 Now Copy and Paste your smoke image onto the canvas and resize it to fit the area near her cigarette. Make sure the smoke is positioned underneath the blinds layer. 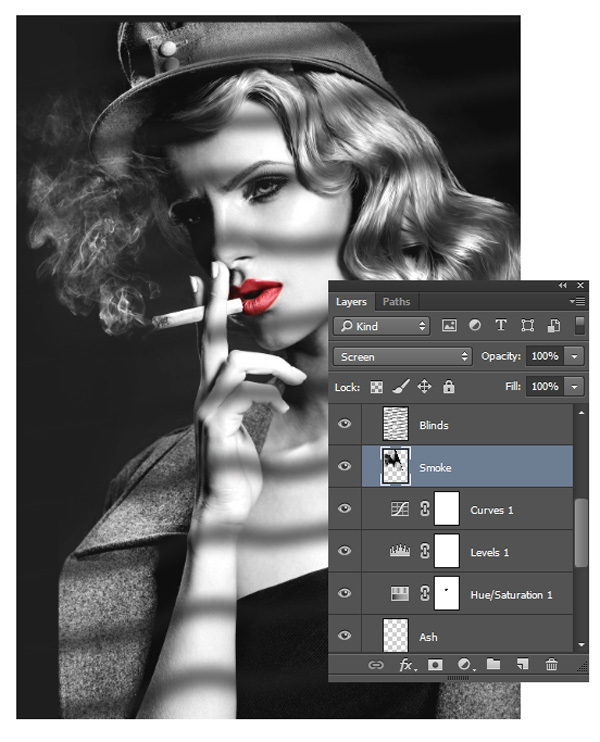 Set the Layer Blend Mode to Screen and erase away any harsh edges or extra smoke with the Eraser Tool (E). Now create another New Layer underneath the Blinds layer. Use a Soft Round Brush (B) to paint white on top of the model’s face for a soft lighting effect. 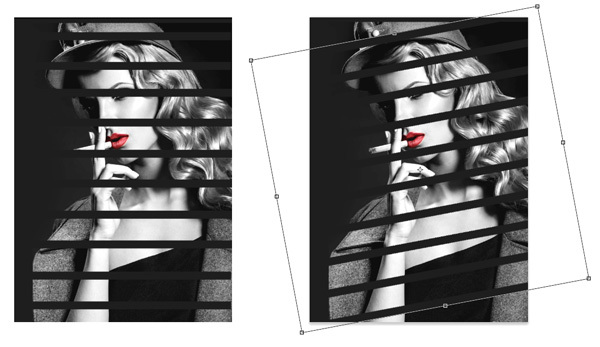 Create one more New Layer above the Blinds layer and begin painting black shadow all around the image. Simulate a slight vignette effect to create more focus on the center of the photo. Last but not least, let’s bump up the contrast one more time! Go to Image > New Adjustment Layer > Brightness/Contrast and set the Brightness to 30 and the Contrast to 26. And that’s it! Here is the final effect. 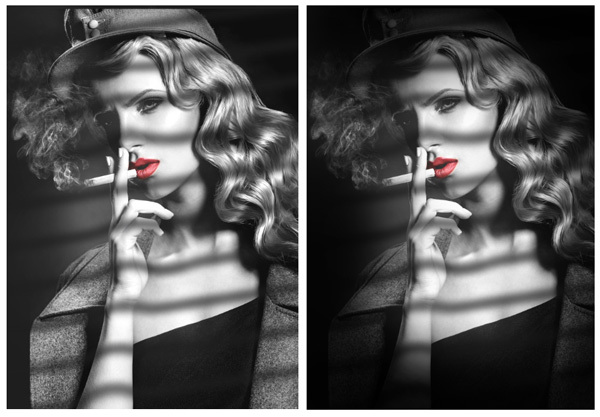 We hope you’ve enjoyed creating this fun and mysterious film noir effect! Have fun trying it out and let us know how you liked it in the comments! Other Classic Tutorials You Should Try As Well!